Private and personalised Madrid experience with a specially handpicked Host. If it’s your first time in Madrid, you’ll want to get orientated and see the city's landmarks! But what if as well as this, you could get a Host’s advice about where to go, what to eat and all the exciting possibilities for your stay? With this experience you can! Discover hidden gems as well as Madrid’s highlights and tourist sights, ticking the most famous attractions off your bucket list while you explore the city with your host who’ll reveal the best kept local secrets that are just around the corner. Get familiar with the city and how to navigate, as well as hearing insider tips about the best local spots and neighbourhoods to visit. Whether it’s the city centre or an off the beaten path neighbourhood, choose the area you’d like to explore and get ready to kickstart your adventure in Madrid! Join a Host who's been specially matched to your interests, personality and needs, and wander through an area of Madrid and discover the main tourist sites as well as hidden local gems along the way, seeing the highlights and getting familiar with the city. Follow the unique route which your personally hand-picked Host has designed specifically for you, exploring the most iconic attractions as well as gaining a local’s perspective on these famous spots and discover the best kept local secrets along the way. Your Host will give your trip a kickstart, helping you to make the most of your time in Madrid by showing you the highlights in the area you want to explore. 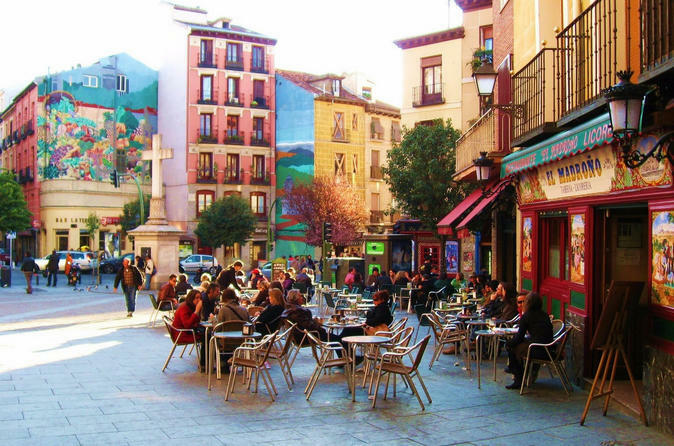 Your Local Host will also advise you on the best way to spend the rest of your trip, helping you to discover other areas of Madrid that they know you’ll love, as well as sharing their local travel tips so you won’t fall into the tourist traps! Options for vegetarians and vegans are available and we’ll make note of any food intolerances to provide the best personalised experience!